What a whirl wind year of bike racing it has been. I started racing in February with the Fort Lewis College Cycling team, after great results and a successful trip to the nationals, I found myself on the Ryan Collegiate All-Star team headed to the Nature Valley Grand Prix in Minnesota. I couldn't wait to race against the top professionals in the country. To add to the excitement, Michael Engleman (director of the US Women's Cycling Development Program, USWCDP) gave me a brand new, full carbon, Time Proteam bike with Shimano DuraAce to race. After my first ride on the bike I was hooked. I was instantly climbing faster, yet with the same power as before, I was also sprinting faster, and best of all, I was beating the guys in my local group rides! I couldn't wait to head out for the race, and my excitement increased even more when the USWCDP left me with one final farewell gift in a set of Shimano DuraAce 7801SL race wheels and some Hutchinson Fusion2 tires. In addition to sponsoring our team, the Ryan family also housed us in Minnesota. The family welcomed us into their beautiful home on the lake, and our team could hardly believe that we got to stay in such a wonderful place all week. I was totally rested and ready to race when we finally left for the first stage of the NVGP. I was surprised when I lined up to start the first stage that I wasn't as nervous as I thought I would be. Instead, I felt confident, confident in my fitness, my abilities, and best of all I was racing on a fast bike for the first time ever. The first stage, a criterium, taught me my first very important lesson in professional bike racing: always get to the start line early and start as close to the front as possible. After a suffer-fest the first night, I vowed to start near the front every day, and stage two went much better as I found myself riding near the front of the peloton and even passing people on the climb in the finishing circuit. Lesson learned. 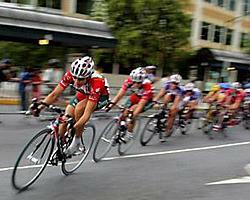 Stage 4, the Minneapolis down-town criterium, went well also. I started in a good position and found myself racing near the front of the peloton and once again finished with the lead pack. Stages 2 and 4 helped me regain some of my confidence after the first night, and I was excited for Stages 5 and 6 because I was finally going to get to climb. All the previous stages involved sprint finishes, and since I am not a sprinter, I was just hanging in the pack, making sure I didn't crash. Finally, I would get to test my fitness against the best climbers! Stage 5 had another important learning opportunity in store for me. The peloton was cruising along, just beginning an 86 mile day, everyone was chatting and relaxed, and I followed suite. I was chatting with a fellow rider, and all of a sudden found myself at the back of the peloton. I wasn't concerned though, I thought I had plenty of time to move up before we actually started racing. Unfortunately, I never got to get to the part where we 'actually start racing' because a big crash in the peloton in front of me left me laying in the middle of the road and my bike broken, as the peloton sped away. Next thing I knew, my director was helping me onto a bike and pushing me off to join a pace line of others who had been held up in the crash. I was so upset, not only had gone to the back of the peloton, but I had crashed and ruined my brand new, beautiful bike, and now I had to ride in a team time trial for 60 miles, on a bike that wasn't mine and didn't fit. I put my emotions aside and took hard pulls on the front of the pace line, but it was too little, too late. We all got time cut and that was the end of my first professional stage race. Just like after stage one, I made another vow to never ride at the back of the peloton, no matter what. Traveling back to Colorado, I was bruised, emotionally and physically, but I was still excited. The days that I had actually raced with the peloton, I had held my own and finished with the leaders. I learned many valuable lessons that I can't wait to use in my next race. I get my new bike today, and after riding my old bike for a while I can't wait to feel the speed and acceleration I felt on my last Time bike. This time, I vow not to start at the back of the peloton, and I vow never to ride there again because my bike is too fast and I am too smart to ever ride at the back again.